God adds a pointless issue to Drupal’s issue queue. Please, think of the issue queue! Read more about Die, phptemplate_ Prefix, Die! Here’s a quick one if you are in need of a noon-time distraction. 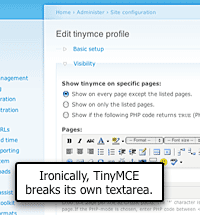 If you’ve ever used the WYSIWYG editor TinyMCE, called “tiny mice” by some, then you know that it likes to hook() up with every <textarea> that it sees.